If you're in an industrial setting using Machine Vision you will probably find an Adept robot at work. The company has spent many years interfacing their robots with vision based tools to allow for identification and assembly of parts. One of the most basic problems with industrial assembly is a process know as parts feeding. In this scenario objects/parts that are required for product assembly are contained in a large bin. The assembly process requires a single part to be isolated from the bin of parts. Adept has pioneered the use of vision in solving this part picking problem. One of the most fundamental tasks that vision is very useful for is the recognition of objects (be they machine parts, light bulbs, DVDs, or your next door neighbor!). Evolution Robotics introduced a significant milestone in the near-realtime recognition of objects based on SIFT points. 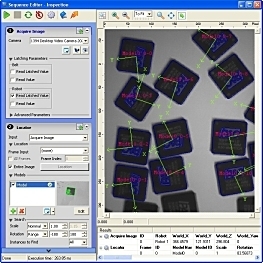 The software identifies points in an image that look the same even if the object is moved, rotated or scaled by some small degree. Matching these points to previously seen image points allows the software to 'understand' what it is looking at even if it does not see exactly the same image. As the hobbyist robotics market rapidly grows so too are the machine vision choices that the hobbyist has at their disposal. The CMUCam (initially created at Carnegie Mellon) is by far the most popular vision camera that can track an object based on its color and even move the camera if it is mounted on servos (small motors) to track the object. At a low price and basic usage it has become very widely used by hobby and academic roboticits. 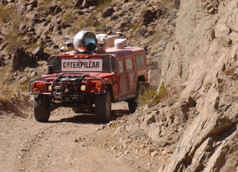 Also knows as the "great desert race", the Darpa Grand Challenge was a raced proposed by the Defense Advanced Research Projects Agency which required racing of unmanned robotic automobiles from California to Nevada. The race attracted the best in what mobile robotics had to offer and included many fields of robotics including vision. Due to the ground speed requirements of the vehicles (about an average of 30mph) many of the racing vehicles used vision as a forward looking sensor to help estimate the direction the car should be going long before it got there. The winner, Stanley from Stanford, used such a technique combined with shorter distance LIDAR systems. RoboRealm attempts to reduce the complexity of using machine vision in robotics by providing a comprehensive user interface to experiment with different vision filters. 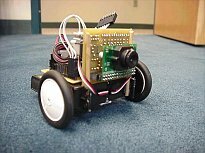 Using RoboRealm you can add vision capabilities to your robot by using inexpensive USB cameras and the PC that you already have. With interfaces to extend the application using your own custom filters and modules to connect to most of the popular servo controllers RoboRealm is quickly becoming the vision software to use with your robot.